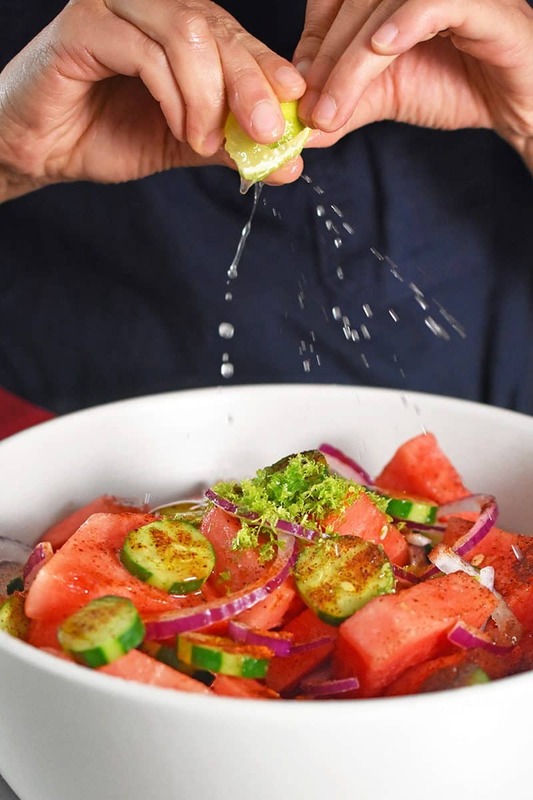 On sweltering summer days, this Mexican Watermelon Salad is like a welcome splash of cool water. Refreshing and sweet, with a punch of spicy pepper and tangy lime, this dish will have you clamoring for more. Besides, it pairs well with just about anything you throw on the barbecue this grilling season! 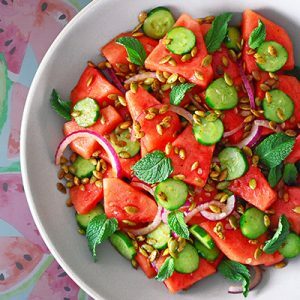 My Mexican Watermelon Salad recipe comes from our new cookbook, Ready or Not!, and it’s one of my favorite hot weather side dishes. You won’t heat up the kitchen by making this tasty crowd pleaser—a win-win in my book. Not a fan of Mexican flavor? Just leave out the ancho chili powder and use more cayenne (to make it spicier) or smoked paprika (to make it smokier). 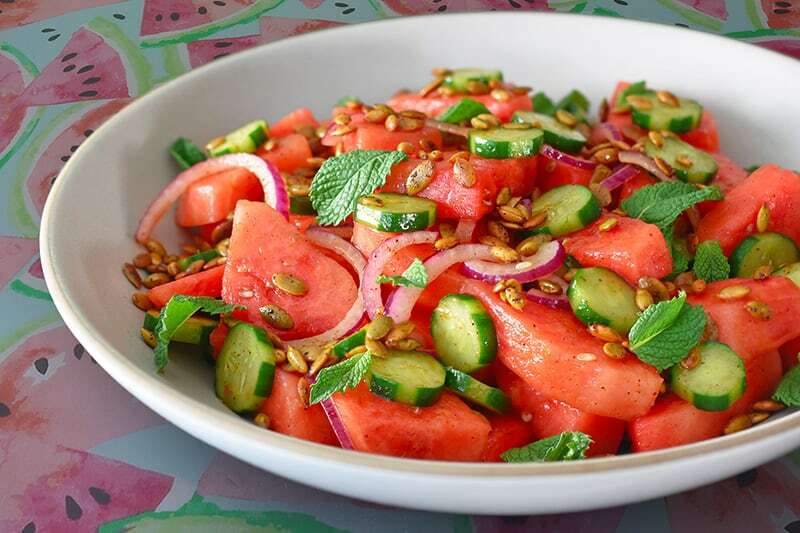 The combination of watermelon, zingy lime juice, fresh herbs, and crunchy and smoky pepitas is truly magical. Wanna see how easy it is to make yourself? Check out this video! 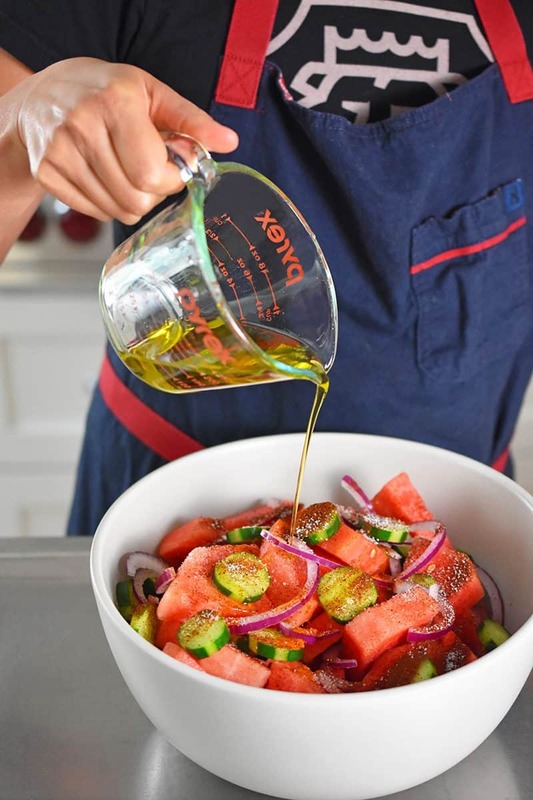 Pro tip: If you’re making this salad ahead of time, don’t add the olive oil, herbs, and pepitas until you’re ready to eat—otherwise, the olive oil can solidify in the fridge and the pepitas can get soft. 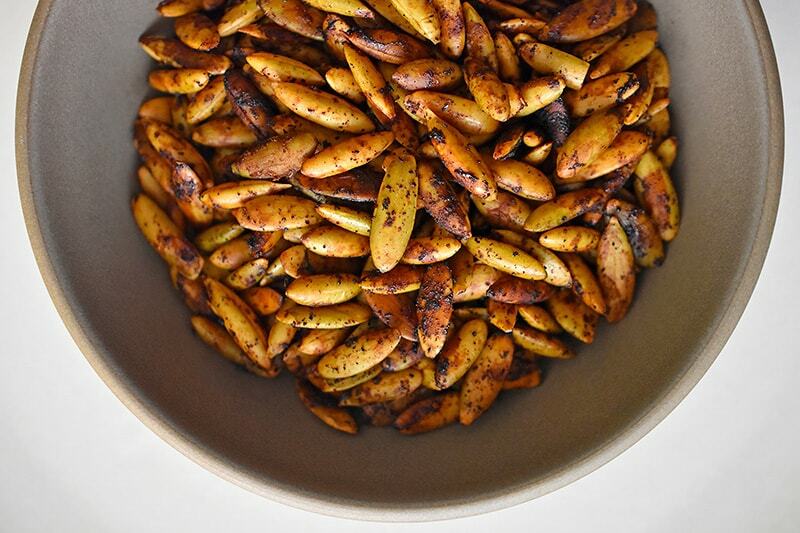 Also, this recipe calls for toasting more pepitas than necessary for this dish, but you’ll thank me later when you have leftover crunchy smoky salad toppers on hand for the rest of the week! Let’s make the spiced pepitas first! 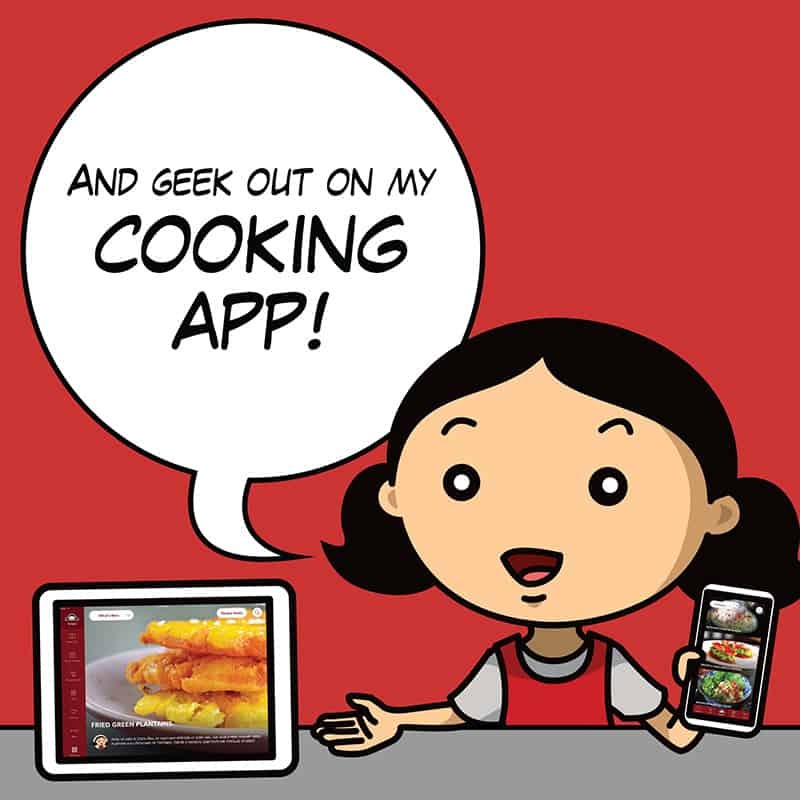 Preheat the oven to 325°F with the rack placed in the middle position. 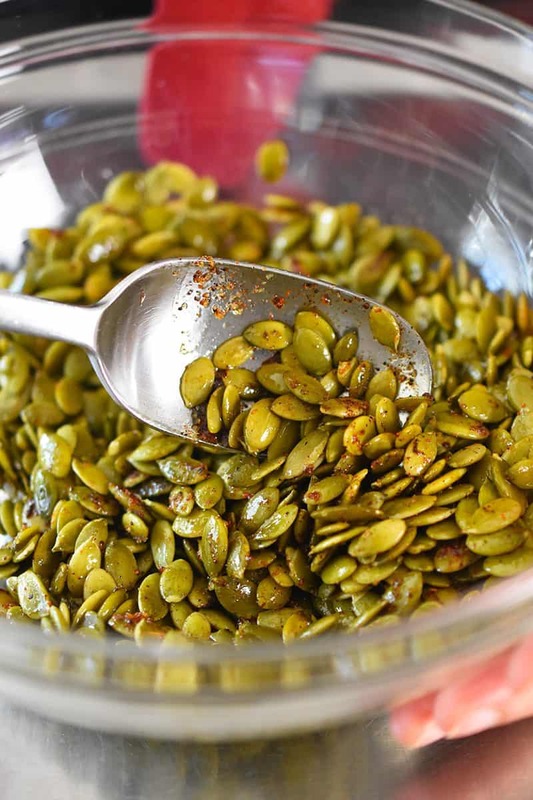 In a medium bowl, combine the pepitas, olive oil, salt, paprika, cayenne, and lime juice. Mix well. 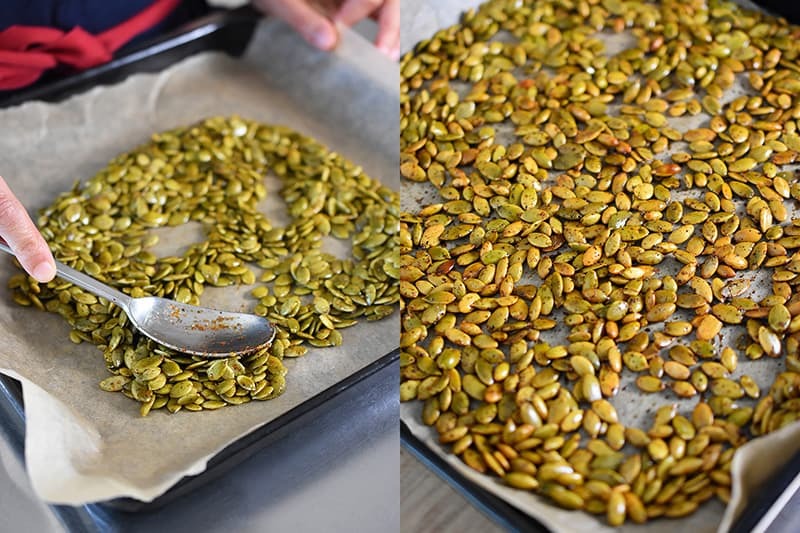 Spread the seasoned pepitas in a single layer on a parchment-lined rimmed baking sheet. Toast the seeds for 12 to 15 minutes in the oven, stirring at the halfway point, until fragrant and crunchy. Cool to room temperature. Reserve ¼ cup for this recipe, and keep the rest in a sealed container for up to 1 week to munch on. 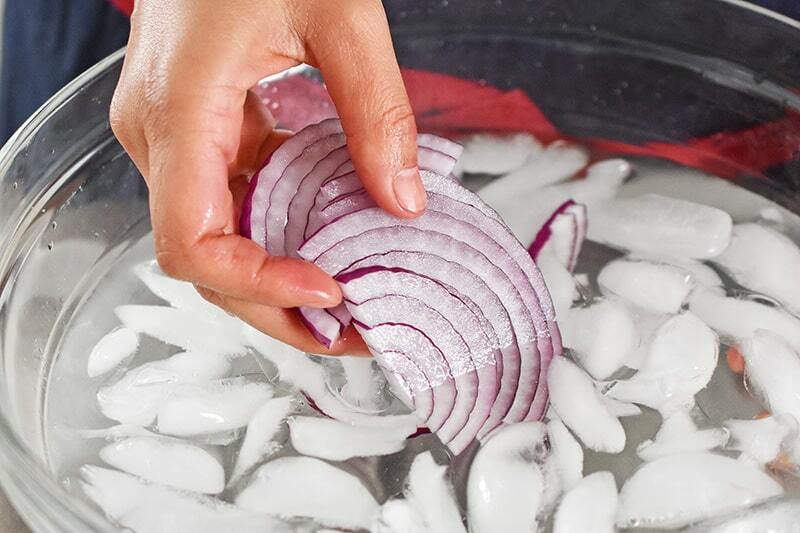 While the pepitas are in the oven, soak the onions in a bowl of ice water for about 10 minutes to take the bite off ’em. …cayenne pepper, lime zest, and lime juice. Toss to mix. Taste for seasoning, and adjust as necessary. 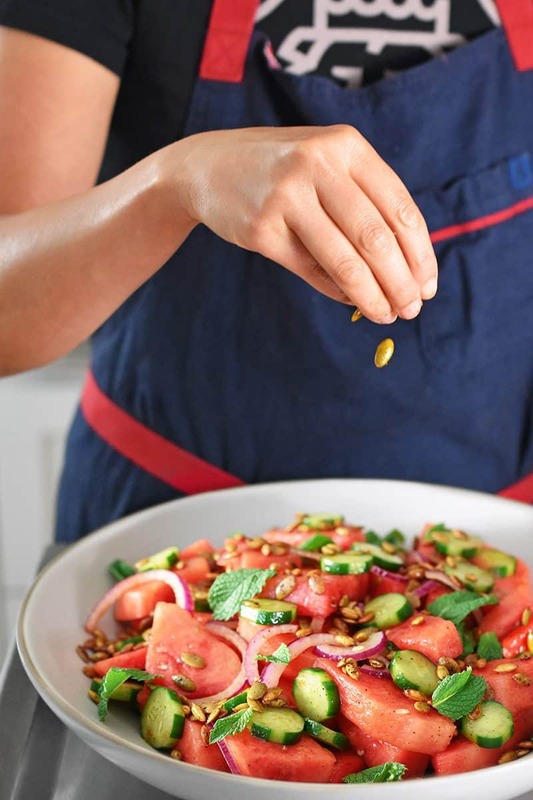 Garnish with fresh mint leaves and toasted pepitas. 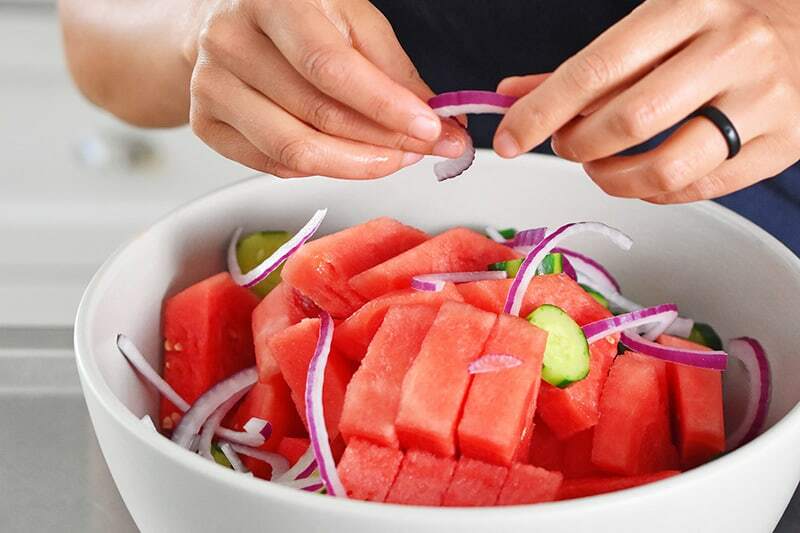 In a large bowl, combine the watermelon, cucumber, drained onions, olive oil, chili powder, salt, cayenne pepper, lime zest, and lime juice. Toss to mix. Taste for seasoning, and adjust as necessary. 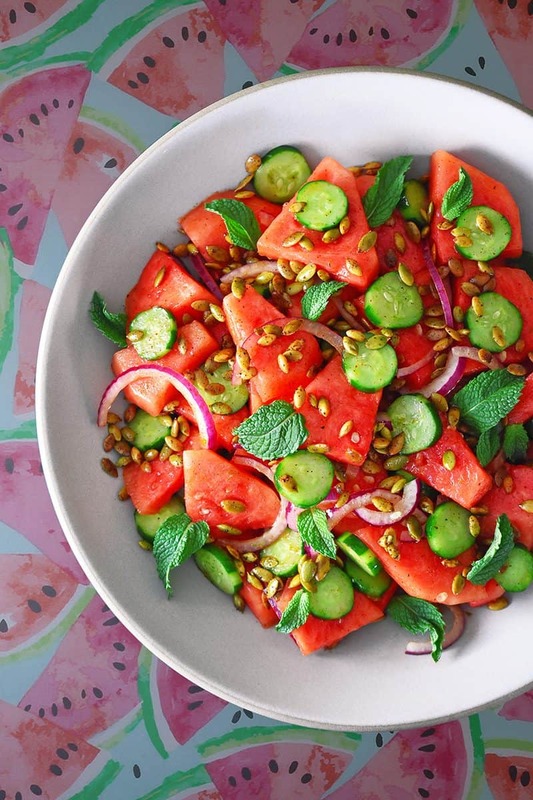 Garnish with fresh mint leaves and toasted pepitas. Serve immediately! Not a fan of Mexican flavor? Just leave out the ancho chili powder and use more cayenne (to make it spicier) or smoked paprika (to make it smokier).